A Bouquet of Bright Balloons is a fantastic way of sending your special message to that special someone. All of our latex balloons are treated with Ultra Hi-Float, a balloon treatment which increases the average float time of latex balloons by 25 times. An 11-inch balloon treated with Ultra Hi-Float will float between 1 and 4 weeks. The Balloon Treatment extender is included in the price of the balloons. Choose from designs with one or two dozen balloons. Option #2: A Beautiful Bouquet of a Dozen bright latex balloons, attached to a cuddly 5-8" teddy bear or other plush animal, $37. Option #3: A Beautiful Bouquet of a Dozen bright latex balloons. This "uplifting" gift comes with a cuddly 10-12" teddy bear or other plush animal, $41. Option #4: A Beautiful Bouquet of a Dozen bright latex balloons. This "uplifting" gift comes with a gift bag of gourmet cookies and chocolates, $49. Option #5: A Beautiful Bouquet of a Dozen bright latex balloons. This "uplifting" gift comes with a cuddly 10-12" teddy bear or other plush animal, and 2 -18" Message Foil Balloons, $53. 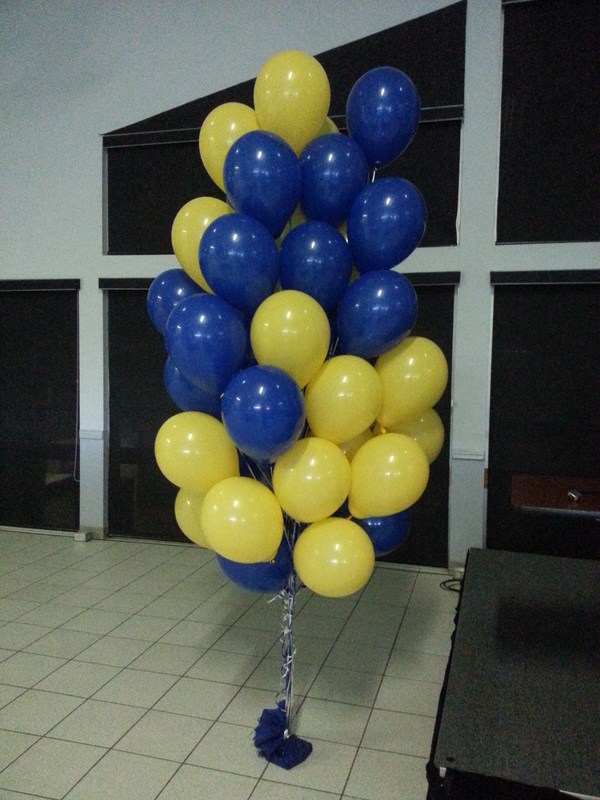 Option #6: A Beautiful Bouquet of Two Dozen staggered bright latex balloons (as shown). This "uplifting" gift comes with a STL standard foil weight, $56. Option #7: A Beautiful Bouquet of a Dozen bright latex balloons. This "uplifting" gift comes with a cuddly 10-12" teddy bear or other plush animal, and 1/2 Dozen -18" Message Foil Balloons, $77. Note: Add a few Message Microfoil balloons for only $4.95 each, available in many themes. Please Note: Latex balloons are not allowed in all hospitals. Please check hospital policy before ordering.